5th and 4th grade have been working on the same concepts for the past two projects. 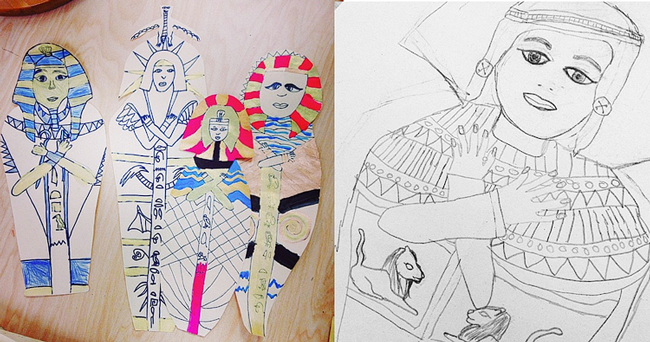 Both grades participated in a school wide Egyptian art unit by creating Egyptian sarcophagi. They reviewed SYMMETRY, and learned about hieroglyphics. 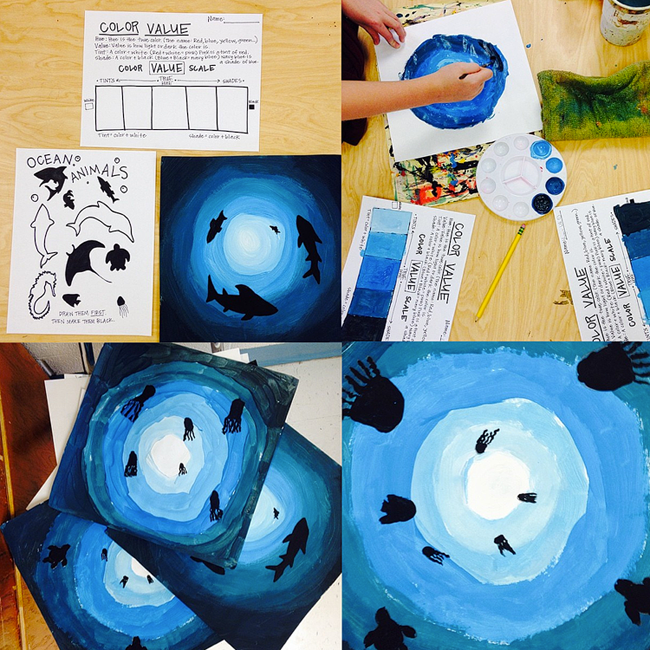 After that, they learned about creating TINTS and SHADES by making an undersea painting. You can find these handouts here- http://www.teachandshoot.com/2015/02/art-room-handouts-round-3-value.html I would have let the students have more freedom with other colors, but I really only had blue left, and underwater came to mind. Thanks for visiting! 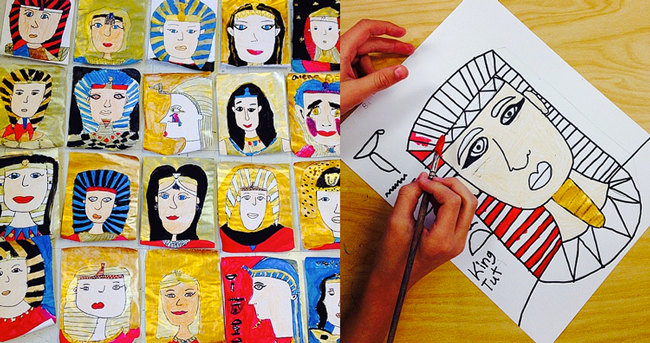 3rd grade also participated in the Egyptian art unit by creating Egyptian PORTRAITS! This might be my favorite project from this year. What a wonderful job the students did! After that, 3rd grade made ORIGAMI frogs, but I forgot to take photos! 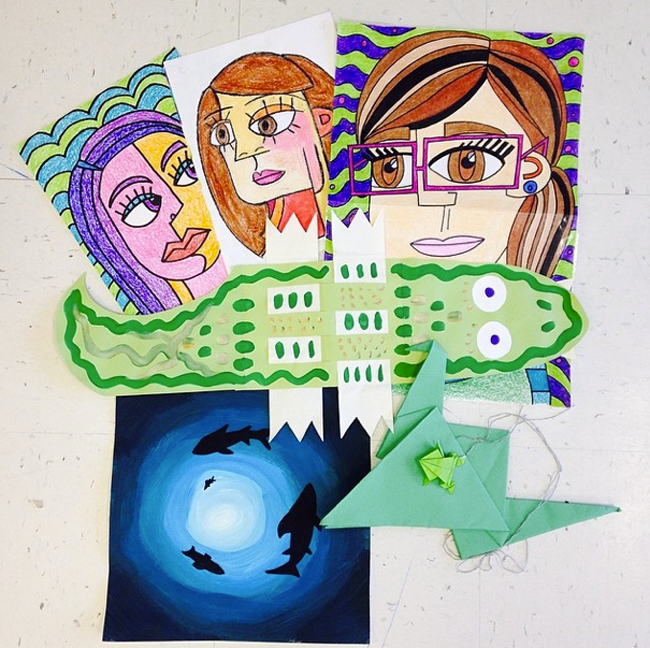 After origami, 3rd grade started creating ASSEMBLAGE art like the artist Louise Nevelson. They are just starting to paint their sculptures this week! 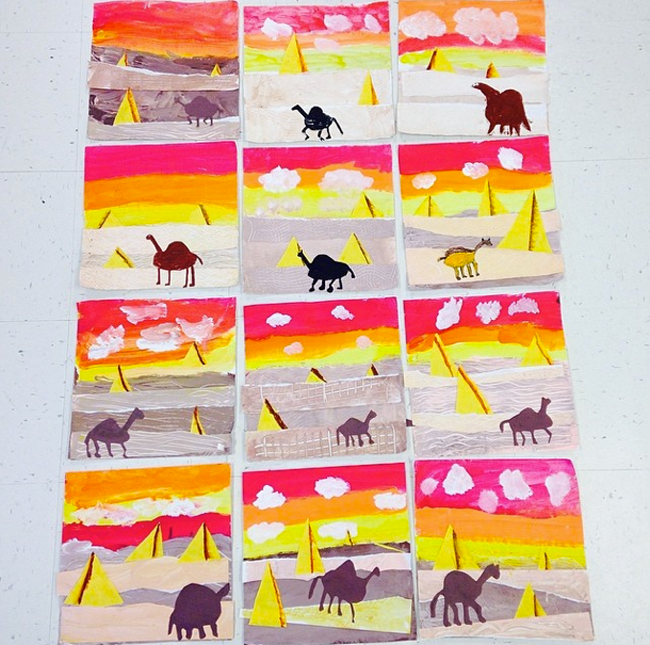 2nd grade created a fun pyramid COLLAGE as part of the Egyptian art unit! 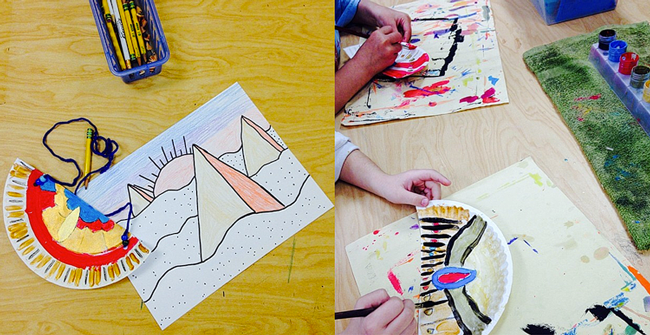 After that, 2nd and 1st grade both created ABSTRACT Picasso PORTRAITS. 1st grade and kindergarten created Egyptian necklaces and learned a little bit about PERSPECTIVE by drawing the pyramids. 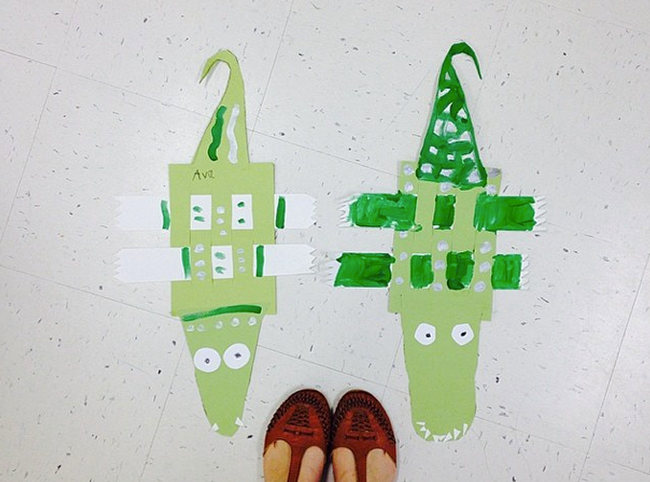 Kindergarten just finished learning about weaving by creating some alligator WEAVINGs! Do you have the sheets available that you used for the Value and the animal sheet also. Just saw this and would love to do it tomorrow if I can reach you! I am also interested in these handouts as well! I would love to have copies of your handouts. Would you be able to email them? My email is reeda@bcsdschools.net. Hello! The underwater pictures really caught my attention on pinterest. Our topic title at the moment is Blue Abyss and this art activity worked perfectly. I am very interested in doing the undersea lesson about tints and shades too. If you are willing to share my email is kdarlington@rvusd.org. I love all your projects. Very inspiring! I love the color value project!! I am a rookie art teacher and I am inspired by your work. If you are willing to share the awesome handouts my email is jessiekubiak@gmail.com. Thank you! Hi, what type of paint is this? Tempera or acrylic? Hi guys, the handouts are on this blog post- http://www.teachandshoot.com/2015/02/art-room-handouts-round-3-value.html and the paint is tempera!